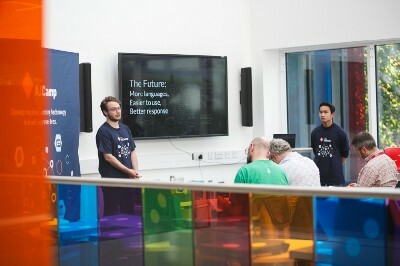 On the 20th of August the A.I.Camp in Belfast began with Chloe and I, and 18 eager students. Thinking back to last year in June neither of us would of believed that we would be mentoring at both A.I.Camps a year on. We were set the task to take what we learned and experienced from last year, and improve upon the foundation that was set by the previous mentors where we’d started our journey into AI. In doing so we created a two-week experience that students could come, complete and walk away with the knowledge base to build their own tools and applications that implement AI and machine learning. Our goal wasn’t just to teach them about the power of machine learning and its potential, but also the soft skills that could be transferable to any job they go for in the future. We wanted to have a really relaxed atmosphere this year to make it a comfortable learning space. 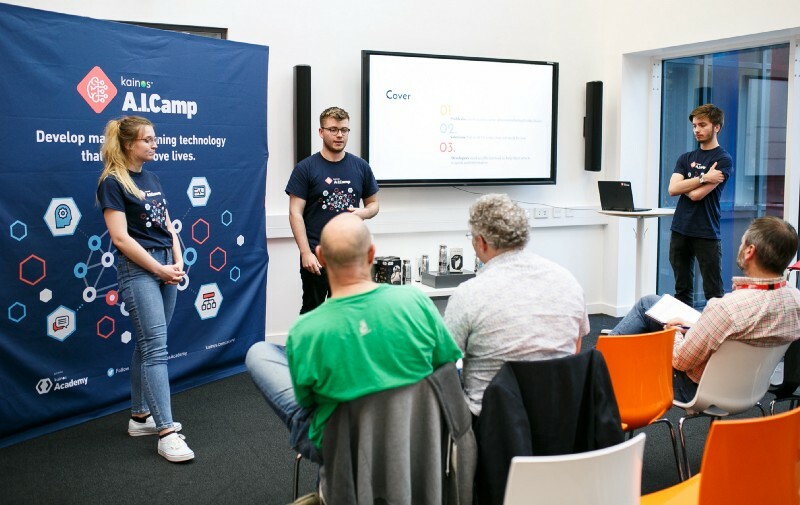 Having gone this direction for A.I.Camp, we noticed that everyone taking part was able to enjoy the experience and learn collaboratively, which was much more effective than imitating a classroom environment. The students were getting involved with technologies which allowed them to develop image recognition, natural language processing and chatbots. Technologies which are only accessible or improved upon with the use of machine learning. 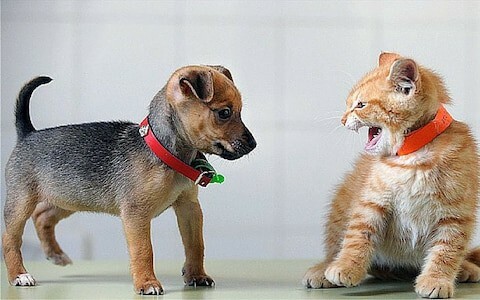 At the beginning of the first week, we introduced the students to a common scenario in machine learning, Cats Vs Dogs. A case where the goal is to recognise whether the image contains a cat or a dog. Image processing and recognition is an area that has become more prominent in the last few years due to the much more accessible hardware. We thought it important that the students taking part were introduced to this area of the field as there are many problems currently that can be solved through image analysis. Another area that the students learned about was natural language processing (NLP); in particular, generating new headlines from previously published headlines. Today we are constantly using tools which make use of NLP. One which you would have likely used as recent as today is predictive text on your smartphone or computer: a technology which is constantly learning your messaging and typing patterns. One interesting application of NLP that Google is developing gives you the ability to use your phone to translate foreign languages in real time with the use of your camera. 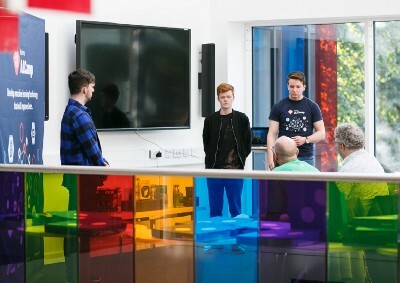 Other than tutorials, the students were also talked to by engineers, talent managers and data specialists from Kainos. 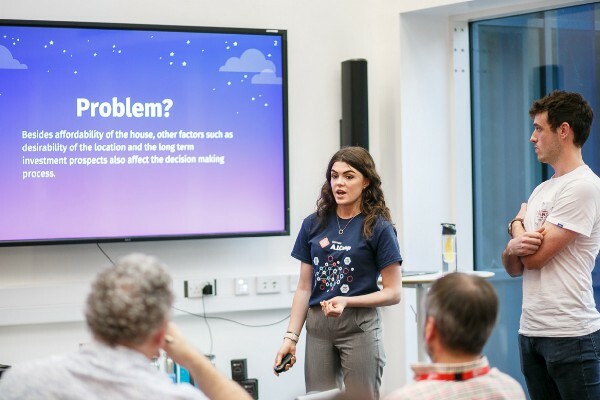 Thanks to them, the students were able to take a lot away from those days about Kainos and it’s services, as well as the progress of Northern Ireland’s tech industry. 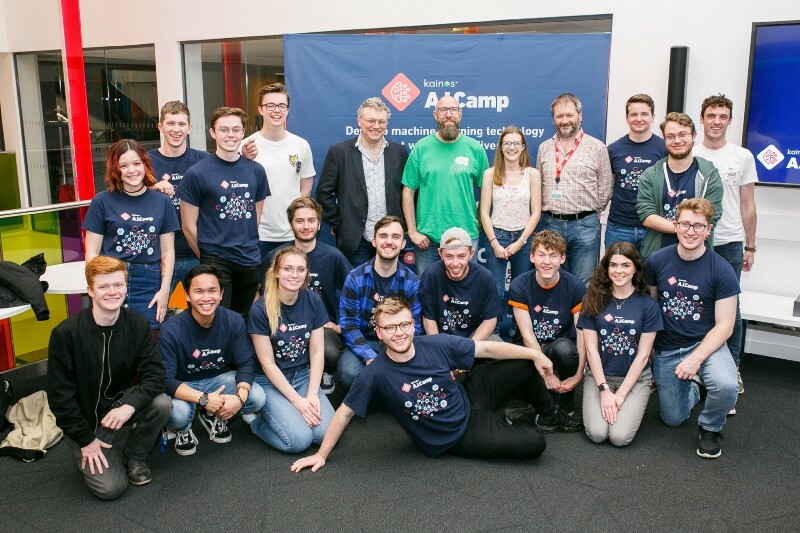 Keeping with the theme of last year, A.I.Camp finished on the second Saturday with an eight-hour hackathon where the students were allowed to develop their ideas in teams of three. The day went well, Chloe and I were there to help and guide the students but refrained from giving them too much. We were happy to see their ideas come to fruition by 5:30 PM, then for them to go and present confidently in front of the judges, it was great. 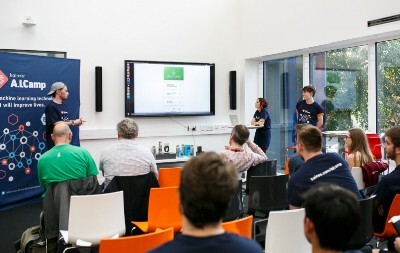 The judges picked StuckOverflow as the winners of the Belfast hackathon. Their idea was to build a service that integrated with StackOverflow to provide fast and accurate answers to questions asked on the website. Overall by the end of the two weeks we were really impressed with the students ability and interest in the area. We couldn’t have asked for a better bunch of people to spend the time with and would recommend the experience to anyone with an interest in AI or machine learning. Who is next to fill this position of mentor? We wish them all the best and to make the most of the experience, it was incredible and teaching is always a rewarding experience. We’ll be glad to share our tips along the way! Think you’d like to take part next year? Register your interest here!